With Christmas and New Year fast approaching, the quintessential English experience – traditional afternoon tea in one of London’s luxurious settings – is a seasonal gift with a difference. Credit for the long-held tradition dates back to the Duchess of Bedford and lady-in-waiting to Queen Victoria, who ordered tea with delicacies in her boudoir for friends. Since then, it has expanded exponentially with almost every major hotel offering its own version, each striving to outdo the other with innovative variations. While all include finger sandwiches on assorted breads with fillings such as cheese, cucumber, egg mayonnaise, ham, chicken, salmon, trout and tuna, followed by scones and cakes, they all also have unique features. Follow in the footsteps of luminaries such as murder mystery writer, Agatha Christie, who supposedly based her novel, ‘At Bertram’s Hotel,’ on Brown’s Hotel, a 177-year old Rocco Forte property in fashionable Mayfair. Queen Victoria also enjoyed tea here, as did writer Rudyard Kipling who completed ‘The Jungle Book’ while enjoying its afternoon delights. Twenty-one teas are proposed and there’s also a Seasonal Tea Library with four special blends, which change regularly, curated by Lalani & Co., with a sommelier offering advice. The ‘Ruinart Rose Sestercentennial Tea for Two’ is the champagne special. Apart from the traditional option, Brown’s has a ‘Tea-Tox Healthy Afternoon Tea’ with smoked chicken and guacamole on spelt bread; poached salmon and dill crème fraiche on dark rye, chicory leaf with smoked mackerel and a soft boiled quail’s egg; gem heart leaf with tabbouleh and chocolate tulipe and mango and coconut rice conde sugar-free cakes. Our tea was served on bone china tableware by Heritage, with a colorful leaf and berry motif. A Japanese Matcha blend, served hot in a martini glass, was a highlight. Located opposite Kensington Palace and Gardens, Baglioni Hotel is an Italian-styled property celebrating La Dolce Vita with black and white photographs of famed screen stars such as Sophia Loren. Creative elegance is reflected in Murano candelabra, a flowing ‘water-on-glass’ fixture near the main entrance representing the iconic fountains of Italy and a rich gold interior symbolizing the European nation’s glorious sunshine. Afternoon tea takes place in the ground-floor restaurant adjoining the lobby on comfy soft armchairs with generous views across the street to the park. In fine weather, a checker-tiled outdoor terrace with wrought iron chairs and tables is used. We were fortunate to be served by Salvatore Maggio, an award-winning mixologist, who had granted us an impromptu cocktail-making lesson the previous evening. Nine types of teas are available including superior Oolong semi- fermented tea, grown in Formosa, rich and elegant with aromas of nuts and fruits; and caffeine-free, Tarry Lapsang Souchong, consisting of Granny’s garden fresh rhubarb, with the sweetness of Bourbon vanilla. In addition to standard sandwiches, the hotel also offers its own Mediterranean version, tasty focaccia with fillings such as courgettes, aubergine and fennel and tomatoes, mozzarella and oregano; Italian Parma ham wrapped around grissini, and bruschetta with bresaola, rucola and cheese. Desserts include Opera cake, beignets, tiramisu and raspberry mousse cake, all served on tableware by Schonwald of Germany. 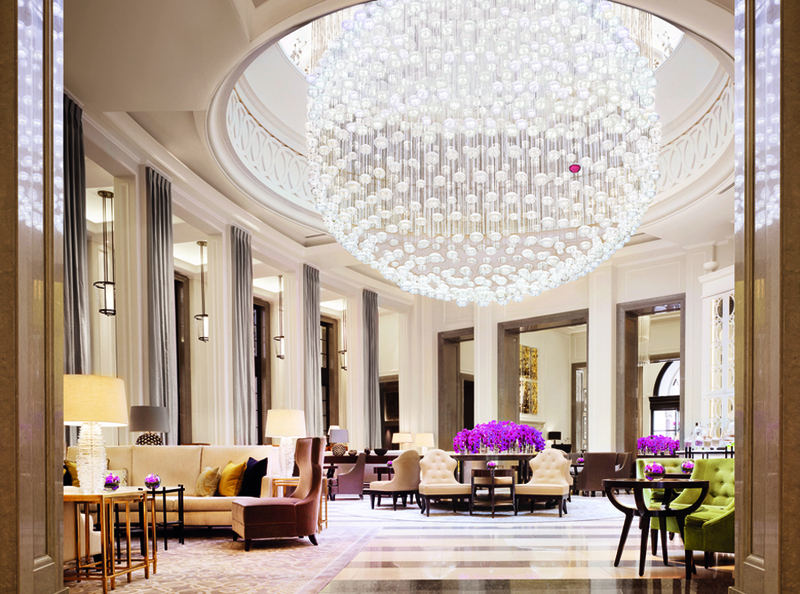 Seated on pistachio and rose-colored armchairs beneath a dazzling 1,000 bulb, Fullmoon Baccarat chandelier created by Chafik in the 5-star Corinthia Hotel, the whirl of London traffic seems a world away. Close to the River Thames and a short walk from Trafalgar Square, Westminster and Covent Garden, this luxury property was opened in 2011 in a grand Victorian building dating from 1885 and offers a warm, contemporary ambiance. Afternoon tea is served in the front lobby lounge, a centerpiece of the hotel, with floor-to-ceiling side windows facing a secluded courtyard and a colorful arrangement by in-house florist Ercole Moroni on a central table. Framed artwork – paper birds cut from fragments of maps by Claire Brewster and a large cabinet filled with multi-colored tea caddies create added character. Twenty-three tea varieties, blended by Harney and Sons, are served on Edward’s porcelain under various categories – Flavored and Herbal, Black Blends, Black Single Estates, Green, Oolongs, White and Historical (the Winston Churchill, a Lapsang Imperial, was particularly aromatic). Laurent-Perrier champagne, both brut and rose, complement the package. Emphasis is on British ingredients. Thus, Loch Var smoked salmon, cream cheese and chives; Severn & Wye smoked trout and cucumber; and Mrs. Kirkham’s Lancashire cheese and Picalilli. Desserts are a story onto themselves, with chapters entitled ‘Dark and Stormy’ and ‘Bramble.’ I couldn’t resist ordering more Pistachio Chantilly, white chocolate and pistachio dacquoise, as well as crispy topped choux, roasted white chocolate, cremeux and raspberry. For Christmas, guests are entertained buy carol singers and can indulge in festive delights such as The Scrooge, a chocolate roulade with tea-infused ganache, and Santa’s Little Helper, chestnut cream and blackcurrant macaroon with sugar snowflakes. Set within a soaring glass atrium, The Landmark London’s Winter Garden restaurant is one of London’s most stunning spots for afternoon tea. Rising high above one’s head and lined with verdant ficus, bamboo, dracaena and palm trees, the ambiance is tropical-like. Built in 1899 during the golden age of steam, this property near Marylebone Station combines classic British elegance and grandeur. Sixteen different teas are on the menu with full-bodied Assam superior from the Zaloni estate in north-east India, a rich and malty black tea; and sencha aloe vera emanating a refreshing taste of pineapple being most memorable. Of the sandwiches, served on Edward’s china, Lapsang Souchong smoked salmon on granary bread and free-range corn fed chicken with tarragon crème fraiche on walnut bread were our favorites. A celebration of chocolate comprises a special afternoon tea with warm, chocolate chip and fruit peel scones served with Cornish clotted cream, hazelnut chocolate spread and lemon curd; coconut and chocolate macaroons; cranberry, blood orange and dark chocolate mousse; and pistachio and chocolate opera gateau. Aside from a gluten-free version The Landmark London also hosts a Christmas Afternoon Tea, which includes rich spiced Valrhona dark chocolate ganache with a tonka bean cream and delicate chestnut and Madagascan vanilla macaroon. Champagne of choice is Pierre Nicolas. Afternoon tea has become synonymous with The Ritz Hotel, a stately property built in 1906 at the edge of St. James’ Park. Exotic, oval-shaped ‘Palm Court’ with its spectacular glazed skylight is the sumptuous setting with live piano accompaniment. Reached up a polished brass mini-staircase off the main corridor, it features gleaming wall mirrors, birdcage chandeliers adorned with ornate metal flowers, a high ceiling with intricate gilded trellis, a striking stone fountain inhabited by large gilded statues and a vibrant central floral display. Among the 16 teas were Rose Congou, a black version from Guangdong, China, enriched with rose petals; Russian Caravan, a blend of Oolong and Darjeeling, producing a sweet floral tea with a slight roasted nut taste; and Ritz Royal English, a blend of Kenyan, Assam and Ceylon Orange Pekoe. Having based its reputation on tradition, the afternoon tea remains just that with sandwiches of a high quality including ham and grain mustard mayonnaise; cheddar and chutney; cucumber, cream cheese, dill and chives; chicken breast with horseradish cream; Scottish smoked salmon with lemon butter; and egg mayonnaise, chopped shallots and watercress. The scones’ texture is similar to brioche. Among desserts were cardamom cream and orange teacake and frangipane almond cake with raspberry cream. Our tea was served on china by Edwards’ decorated with forget-me-nots. Champagne is Reims-based Castelnau. To celebrate the season, carol singing takes place. Posted in Destinations, RestaurantsTagged afternoon tea, Agatha Christie, Assam, baccarat, Baglioni Hotels, Bourbon vanilla, breads, British, Brown's Hotel, cakes, carols, Castelnau, Ceylon, champagne, chocolate, Christmas, contemporary, Corinthia Hotel, Covent Garden, Darjeeling, European, gifts, glass, Harney and Sons, healthy, historic, Italian, Japanese, Lalani & Co, Lapsang souchong, Laurent-Perrier, London, Marylebone station, matcha, Mayfair, Mediterranean, mixologist, Murano, New Year, Oolong, Pierre Nicolas, Queen Victoria, Reims, Rocco Forte, romance, Rudyard Kipling, Ruinart, sandwiches, scones, seasonal, St. James Park, tea, Thames, The Landmark Hotel, The Ritz Hotel, Trafalgar square, Valrhona, Victorian, WestiminsterBookmark the permalink.